I would like to cut a hole that is wider on the bottom of the sheet than at the top. 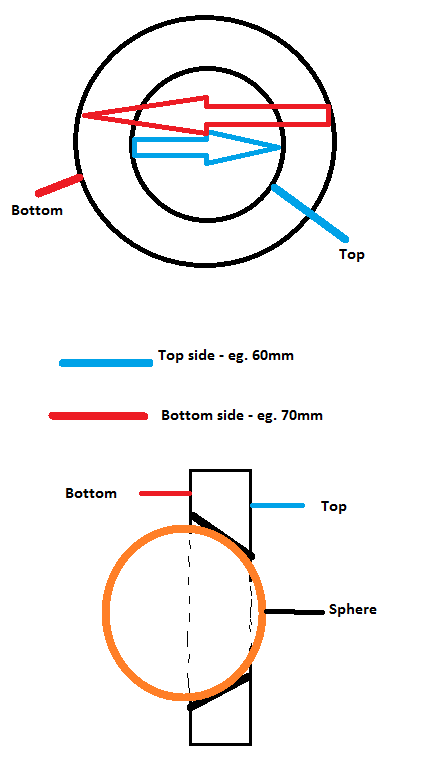 So for example using a 60mm holesaw gets me the same diameter on both sides of a 21mm thick sheet. How can I get 60mm on the one side and 70mm or so on the other side, with a flush straight angled surface between the two sides (around 45 degrees). Doing some googling, I came across beveling but I cant seem to find any large enough bevel or countersink bits. The purpose will be for a spherical object to sit nearly flush on the cut section and slightly protrude on the visible top/front side of the sheet (I have attached a basic image trying to show what I am trying to accomplish). Any advise appreciated but ideally using the machinery I currently have (drill, table and circular saw, jig saw and grinder). Please also forgive my lack of terminology here as I am new to this. I'm not sure it's doable with the tools you list. Make a hole template in a bit of scrap plywood by drilling a hole with your 60mm holesaw. Make the 60mm hole in your workpiece. You could leave it slightly undersize (1mm or so). Use your template with a 45 degree chamfer router bit with a bottom bearing to cut the bevel. Don't try to hog it all off in one go - take small bites. If you don't have access to a router you could use a half-round file or rasp if you have a good eye. Not the answer you're looking for? Browse other questions tagged wood or ask your own question. What would be the best way to bevel an oval table top? How long after cutting wood can I wait to glue? After stripping paint and applying wood stain, item is looking very blotchy… now what? How soon should I cut up new wood?